What a long, strange trip Hairspray has taken. Beginning as a shockingly wholesome PG-rated film from Pink Flamingos filmmaker John Waters — the master of trash and camp — Hairspray transformed into a smash hit Broadway musical before morphing into a second movie with John Travolta playing the mother-in-drag character originally inhabited by Divine. So as I was sitting in the Cameo Theatre in San Antonio last Saturday night, watching the opening number, “Good Morning, Baltimore,” I couldn’t help but be struck by the irony of it all. I’ve covered hours and hours of theater in L.A., I’ve seen dozens of productions on Broadway, and now here comes Hairspray, welcoming me to my new Texas home like an old friend. The upbeat show is certainly transcendent, speaking to all types of audiences, regardless of locale, ethnicity or persuasion. It’s a story that makes an earnest plea for racial equity and acceptance of those who might be perceived as “different.” And it sure doesn’t hurt that the Tony Award-winning score is jam-packed with rousing numbers that any theater company would love to sink its teeth into. That’s the kind of infectious enthusiasm the cast at the Cameo delivered on Saturday. 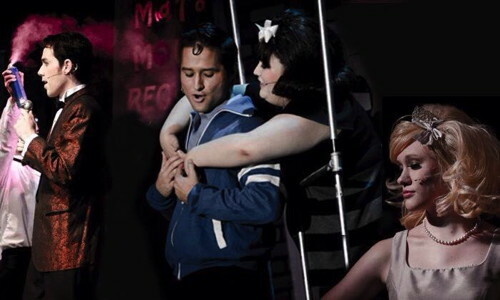 Set in 1962, Hairspray is the tale of plus-sized high-schooler Tracy Turnblad (Krystal Newcomer) who is obsessed with the local teen television program The Corny Collins Show and especially its brooding heartthrob, Link Larkin (Agustin Olvera). When she hears that the show is going to be auditioning for new dancers, she drags her best friend, Penny Pingleton (Jovi Gonzales) along to the studio to support her in her bid for the big time. There, she runs into Amber Van Tussle (Cindy Koch), the top girl dancer on the show — and Link’s main squeeze — as well as Amber’s mother, Velma (Louie Canales), the show’s producer, who immediately tosses Tracy out on her ear because of her size. And when Tracy sees Velma snubbing the equally enthusiastic Little Inez (Danica McKinney) merely because she’s black, she realizes that changes need to happen. Hairspray’s book, by Mark O’Donnell and Thomas Meehan, telescopes Waters’ original screenplay to allow time for the number of songs that an all-out musical requires. 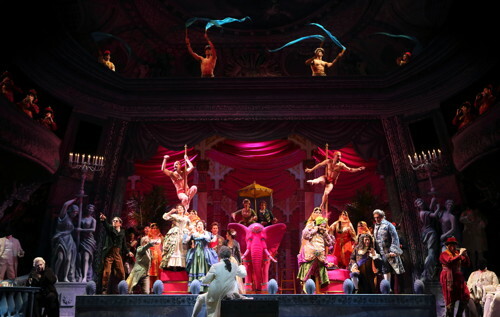 Marc Shaiman and Scott Wittman’s bouncy score helps to fill the gaps with tunes that advance the narrative while providing the kind of showstoppers that audiences demand. They also managed to work in enough offbeat humor to keep Waters fans satisfied. Jonathan Pennington’s new production at the Cameo is lively and colorful, featuring a two-story set that does some interesting stuff with silhouettes and lighting to give it that big show feel. 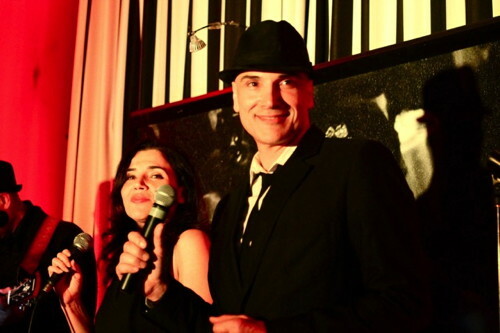 Co-directors Pennington and Jovi Gonzales have their hands full organizing all of that activity on the Cameo’s modest stage, but they manage to pull it off. As for the performances, Newcomer as Tracy is terrific, projecting just the right amount of enthusiasm and optimism. Canales is lots of fun as the villainous Velma, as is Koch as her spoiled-rotten daughter, Amber. Olvera brings the Elvis moves as Link, and Sean Salazar is also good as the too-smooth Corny Collins. But Gonzales threatens to steal the show as the nerdy Penny, and James Estes is a riot as Tracy’s mother, Edna, who manages to evoke memories of both Divine and Harvey Fierstein, with his husky voice and considerable attitude. Also exceptional are Michelle Burnett as the rhymester Motormouth Maybelle, and McKinney, who displays considerable pipes as Little Inez. 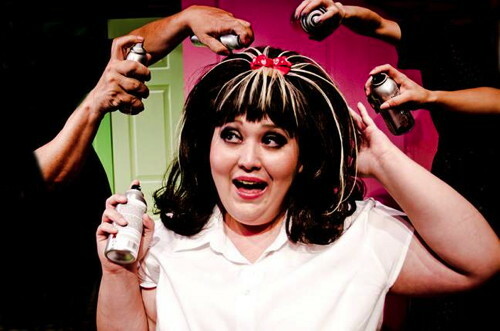 Hairspray plays Fridays and Saturdays at 8 p.m. and Sundays at 4:30 p.m. through March 1 at the Cameo Theatre, 1123 East Commerce Street, San Antonio 78205. Reservations can be made online or by calling the box office at (210) 212-5454.